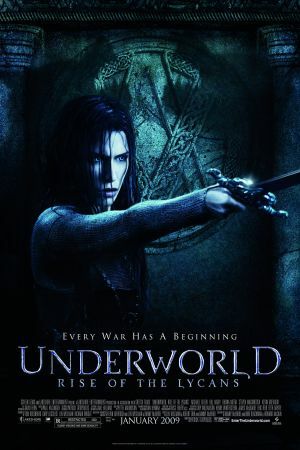 The third film in the UNDERWORLD saga goes back hundreds of years to explain the origins of the feud between the vampire Death Dealers and the werewolf Lycans. Taking over directing duties from Len Wiseman is rookie Patrick Tatoupolos, known for his creature-designing duties in GODZILLA (1998), I AM LEGEND (2007), and the first two films in this series. Less an action-horror film than an old-fashioned "sword-and-sandal" film with monsters, RISE OF THE LYCANS finally gets to the root of why those vampires and werewolves really can't stand each other. Ruled by Viktor (Bill Nighy, VALKYRIE), the aristocratic, vampiric Death Dealers keep the wolflike Lycans as slaves. When a captive Lycan woman births a human boy, Viktor resists the urge to kill it, instead naming him Lucian and keeping him as a pet. Lucian (Michael Sheen, FROST/NIXON) grows up to be a blacksmith with the ability to change between human and wolf and begins a clandestine romance with Viktor’s daughter, Sonja (Rhona Mitra, DOOMSDAY). Viktor learns of this forbidden romance and takes drastic steps to ensure that Sonja will never be able to see Lucian again. Lucian, in retaliation, leads a Lycan slave revolt, resulting in an all-out assault on Viktor’s kingdom. Though viewers who have skipped the first two installments of the saga may feel a little left out when it comes to the mythology of the series, LYCANS hits the ground running and doesn’t allow much time for questions. While Sheen has been lauded for his work in more traditionally dramatic films, here he gives his all to every growl and battle cry. Mitra is an appealing presence as Sonja, and Nighy is visibly relishing the opportunity to glower in his blue contacts and chew the moonlight-bathed scenery.